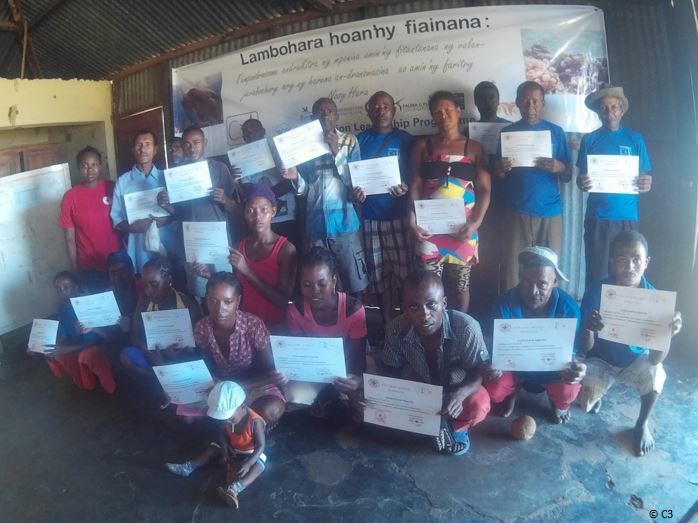 After more than a decade of CLP support to Community Centred Conservation (C3) in Comoros and Madagascar, we are delighted to share part of their journey and some of their successes to date. C3 is a non-government organisation that works to empower local people to make informed decisions about natural resource management, decisions that protect their livelihoods and the species and habitats they depend upon. C3 has been working in Comoros and Madagascar since 2006. The Western Indian Ocean that surrounds these island countries offers vital habitat for many marine species including sharks, sea turtles and dugongs – a marine mammal that feeds exclusively on seagrass. Dugong populations worldwide are decreasing due to habitat loss, hunting and incidental capture in fishing nets. 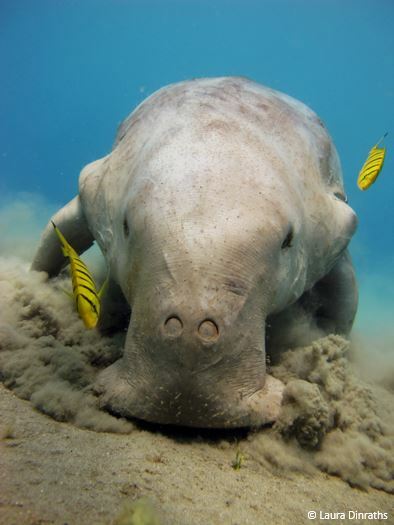 While there are some legal frameworks that protect the species, efforts to conserve dugongs in the Western Indian Ocean have been hampered by a shortage of trained national staff with the technical skills to study at-risk species, translate data into species management plans, and work with local officials on enforcement. With CLP support, C3 has been addressing these challenges over the last 10 years, increasing understanding about the presence of dugongs and generating awareness about this shy and elusive species. Their 2006 Future Conservationist Award in Comoros helped to lay the foundations for a decade of successful conservation initiatives in the area. 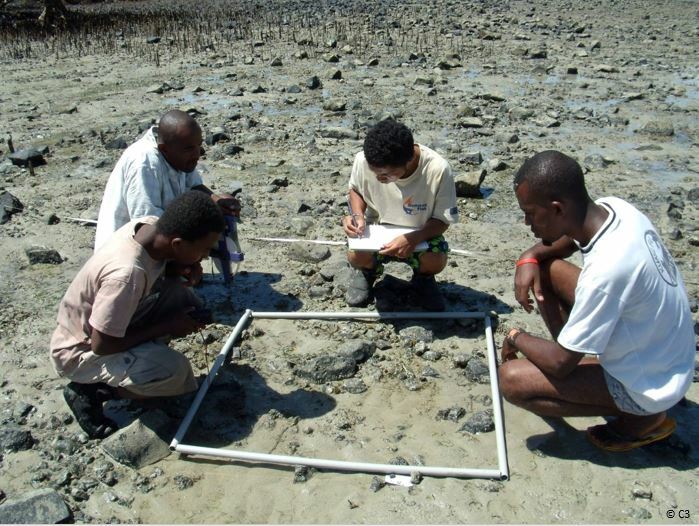 Via its 2009 CLP Follow-Up Award, C3 conducted baseline surveys of seagrass habitat in northwest Madagascar, as well as interviews with local people on dugong occurrence and traditional knowledge of the species. The team discovered a sharp drop in the dugong population starting in the 1960s. Once abundant, dugongs dwindled as local communities hunted them for meat and oil; the species was hunted until it no longer became viable due to rarity of encounters. The greatest threat to dugongs today comes from accidental bycatch in gill nets, heavily used throughout coastal artisanal fisheries. Using the results of its fieldwork, the team successfully generated a National Dugong Conservation Action Plan for both Comoros and Madagascar. The team’s work extended to other waters as well; seven months into this project, team member Patricia Davis was invited to participate in the United Nations Environment Programme’s Convention on Migratory Species meeting in Singapore. Here, a group of specialists developed an international protocol for the rapid assessment of dugong populations which is now utilized worldwide to ensure data comparability. This assessment was based largely on CLP team methods. In 2010, C3 started working in the Nosy Hara Marine Park region, an island archipelago off the north-west coast of Madagascar. Expanding on techniques and experiences gained during previous CLP projects, the team broadened its focus to include conservation related not only to dugongs but also to turtles and sharks. In 2014, C3 was awarded CLP’s topmost grant, a $50,000 Leadership Award, which enabled the team to focus on data collection for all three of these groups, build the capacity of resource managers and eco-guards, and develop alternative livelihood cooperatives to benefit local people. The work of C3 has had a significant impact on the survival of target species and improved community livelihoods. Working with the park authority and management committees, cases of illegal fishing and hunting are now being systematically reported and recorded. Local fishers now have a much-improved understanding of the rules and regulations of the marine park and have been empowered to protect its natural resources. Since the start of the project, there have been no marine park infractions and no incidents of dugong or sea turtle mortality. The livelihood programmes set up by the team have also been a success. These programmes include a community ecotourism restaurant and a poultry farm, both run by a local women’s association named FIVEPANOHA (Fikambanan’ny Vehivavy ny Parka Nosy Hara). Seven percent of the population within Nosy Hara have benefited from these new, alternative sources of income. C3 is continuing its work with investment from other donors and CLP will continue to support project team members as they advance in their careers. We eagerly anticipate what the next ten years of C3 work will yield in the Western Indian Ocean.